I’m married, so that means I’m never right. It was one of the subliminal vows I took at the altar. Thank God I have a blog. 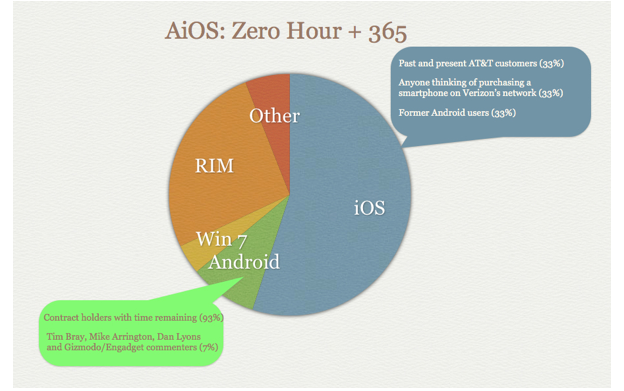 When Verizon announced their intent to carry the iPhone, I made a prediction about what that would mean for Android. I was pretty aggressive about what the market would look like a year after the announcement, once a substantial number of peoples’ 2-year Verizon contracts expired. Back to my being right, the market share numbers for the first quarter were released and – wouldn’t you know it – the iPhone holds a 59% share. I’d say I should work for Gartner, but I think my being right about things would wreck their curve.